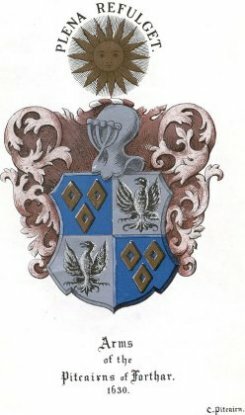 Thomas, the second son, was owner of Pettcarne in Strathearn, which he resigned to Lord Methven. The charter was in the reign of King James III. Confirmation by King James III of a charter by William de Ruthven of that ilk, to David Guthrie of Kincaldrum, and Janet his wife, of the lands of Petkarne (Pitcairns, Dunning),with superiority thereof, in the barony of Ruthven and Sheriffdom of Perth, which were resigned by Thomas de Petkarne. Dated 24th May 1465. Confirmed, 22nd June 1465. Thomas Pitcairne seems to have left Pitcairne after this, as in 1485 he is mentioned in the Exchequer Rolls as being tenant of 3/16th parts of the lands of Freuchy in the Quarter of Falkland, Fife.